Complete Audio Visual Equipment Ltd is a specialist audio visual company with decades of experience in domestic and commercial AV design, installation and maintenance. "The timing for installing the projectors and screens is deliberate so that all our guests and visitors can experience grassroots international rugby on the pitch and then watch the professionals play on the new giant screens." 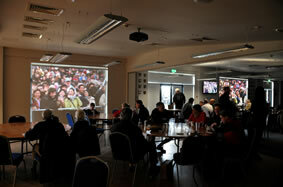 Challenge: Farnham Rugby Union Football Club wanted to upgrade its old 50” LCD screens to larger projected images to enable hundreds of spectators, expected at the club for the Rugby World Cup, to watch the games. Solution: Complete Audio Visual Equipment installed two bright 1080p EH501 projectors in the Dining Room and Main Bar with a CYP 8 x 8 Matrix Switcher to provide multi-room connectivity. New 3.5m wide blackout blinds for the clubhouse’s windows would fulfil the dual purpose of also being projection screens for the matches. 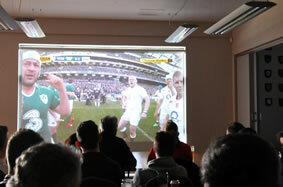 Farnham Rugby Union Football Club wanted to upgrade its old 50” LCD screens to larger projected images to enable hundreds of spectators, expected at the club for the Rugby World Cup, to watch the games. The installation had to be complete for the first Six Nations Game in February 2015 (England v Wales) so that it was all ready and tested to show all Six Nations games and then the major international event being hosted by England from 18 September 2015. The club hires out all or part of the facilities for business meetings, weddings and other functions – so it was important to upgrade the AV system to be easy to use and compatible with a range of sources. The club was spending money on adding blackout blinds to all the windows, so it chose material for the 3.5m wide blinds that would be suitable to fulfil a dual purpose of becoming projection screens. Complete Audio Visual Equipment tested the image quality on the proposed material for the blinds and installed two Optoma ProScene EH501 projectors in the Dining Room and Main Bar. These rooms have a movable partition wall to make one large space during major sporting events or private functions. The bright Full HD 1080p (1920x1080) EH501 projector boasts a brightness of 5,000 ANSI lumens. Optoma projectors use DLP® technology, pioneered by Texas Instruments. This uses millions of mirrors to produce high quality imagery which does not suffer colour degradation over time, as sometimes experienced in other projector technologies. Optoma is so confident that colours will not degrade, it includes a five-year colour guarantee. And because there are no filters to remove and clean, the projector needs no maintenance. Ideal for large meeting rooms and lecture theatres, the EH501 is also designed for medical professionals. Its DICOM simulation mode is specially tuned for viewing greyscale images and perfect for viewing X-rays and scans during medical training. Its 1.5x optical zoom makes installation easy when organisations are replacing their existing projectors and its vertical lens shift system simplifies installation further by adjusting the vertical position of the projected image. The projector has a USB Reader which can project a JPEG presentation directly from a USB flash drive. It has energy saving features including Eco+ lamp power management, standby mode and auto power off. With full support for Crestron, Extron, AMX, PJ-Link and Telnet LAN commands, the projector can be controlled and monitored remotely over a LAN. This can provide email alerts if an error occurs, a lamp fails or needs to be replaced. 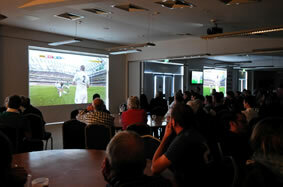 Hundreds of local residents can now come to the club to enjoy a drink at the bar while watching the games. 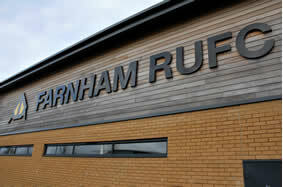 Established in 1975, Farnham RUFC has grown to become Farnham's largest charitable community sports club with over 1,000 members. Each weekend over 800 boys and girls, from as young as five years old, regularly play rugby at the club’s Wilkinson Way-grounds. 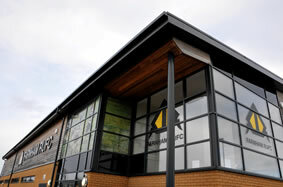 The Club has produced a number of great players who have gone on to play for professional clubs and international honours - the most famous include Jonny Wilkinson and Peter Richards. The Rugby World Cup starts with England playing Fiji on Friday 18 September. That weekend Farnham RUFC is also hosting the European Veterans Rugby (EVRA) Festival 2015, with teams arriving from all over Europe (www.evra2015.com). Julian explained: "The timing for installing the projectors and screens is deliberate so that all our guests and visitors can experience grassroots international rugby on the pitch and then watch the professionals play on the new giant screens." The RWC final takes place at Twickenham in London on Saturday 31 October 2015.